I first was introduced to Heather Zoppetti the way I’m sure many knitters were — via her stunning Dahlia Cardigan in the Fall 2011 Interweave Knits. It was a garment that really made me sit up, take notice, and take immediately to the internet (via ravelry) to find out what else this designer has done. At the time, she didn’t have many other designs published, but in just 3 short years, Heather’s been amazingly prolific – designing for Interweave, her own indie line, and yarn companies. 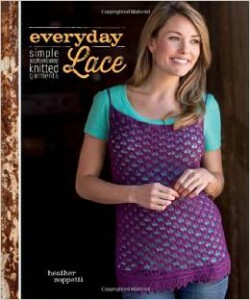 So I guess it shouldn’t surprise anyone that she’s recently authored a book filled with her designs. Everyday Lace is, as its subtitle states, a collection of simple, sophisticated knitted garments, very much in keeping with the promise of that first (for me anyway) design. Like Dahlia, the garments and accessories of Everyday Lace incorporate lace in clever and unpredictable ways. My favorites are the Ephrata camisole (cover design), with its gorgeous all-over lace and a fun sideways-knitted border; and the Kirkwood vest, a simple and completely reversible vest with great drape. I’m also in love with the two lace berets – Salunga and Murrell. The book contains 18 designs – 9 accessories (including wraps, hats, socks, and gloves) and 9 garments; and is divided into three sections – warm, transitional, and cold – corresponding to the seasons and climates appropriate for each design. The warm section is made up primarily of tanks, camisoles, and small light accessories. The transitional section is populated with those items of clothing we reach for when the temperature starts to cool – wraps, vests, socks, long mitts; while sweaters, hats, and a cowl occupy space in the cold section. These sections really highlight the versatility of lace – how it can be used sparingly in larger gauges for winter sweaters or in an all over pattern for light, airy, summer camisoles (worn over some sort of undergarment of course!). The knits are photographed in what looks to be an unfinished, rustic barn. The peeling paint and rough hewn wood is a nice contrast to the delicacy of some of the lace pieces. Like many of Interweave’s single-designer collections, there are informative side bars covering useful techniques and hints. Heather guides the knitter through the unique challenges of knitting lace. Sidebars include hints in chart reading, swatching, blocking, and lifelines. This is a solid collection that builds upon Heather’s existing body of work. Release date is Sept 11, 2014, but Amazon is accepting pre-orders now. Standard Disclaimer: I was provided a complimentary copy of the book for this review.